Chicken Chicken Chicken Chicken. Egg. Almost two weeks ago, we bought four chickens from a local microbiologist. Despite the oddity of buying from someone whose interest in chickens seemed to be somewhat scientific – he was interested in egg color or something along that nature – it was a perfectly normal transaction. Chris walked through the chicken yard with the owner and pointed out the hens we chose. I hung back on the other side of the fence, not quite trusting the birds. Their beaks looked pointier and their claws much sharper than I expected. Four hens – two beige and two dark tan ones – were lifted by their legs, carried briefly upside-down and loaded into the cage we brought. After a noisy but uneventful ride home, Chris released the chickens into the chicken coop that he had built for them in the barn. We coaxed them out into the yard. We poured feed into their brand-new automatic feeder – it resembled a big tin can the size of an oatmeal canister fastened above a big tin plate. Their watering container was filled with fresh water. The nesting boxes had fresh dried grass. 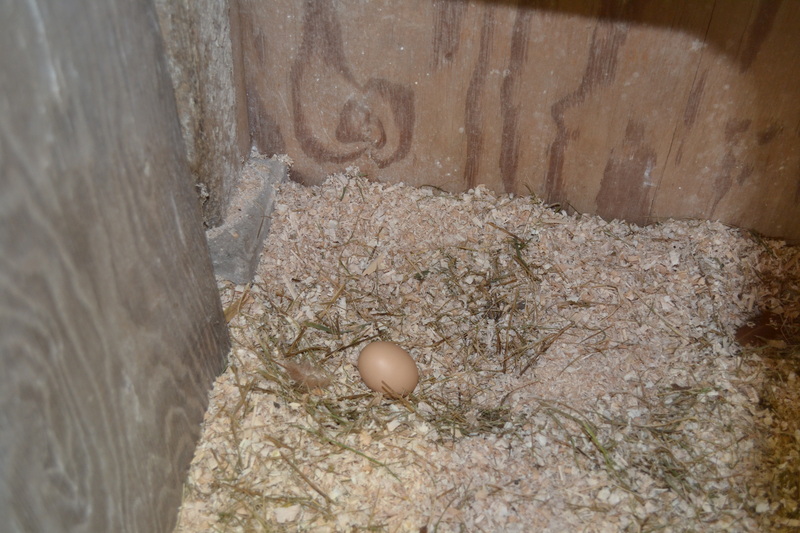 The bottom of the coop was lined with pine shavings. 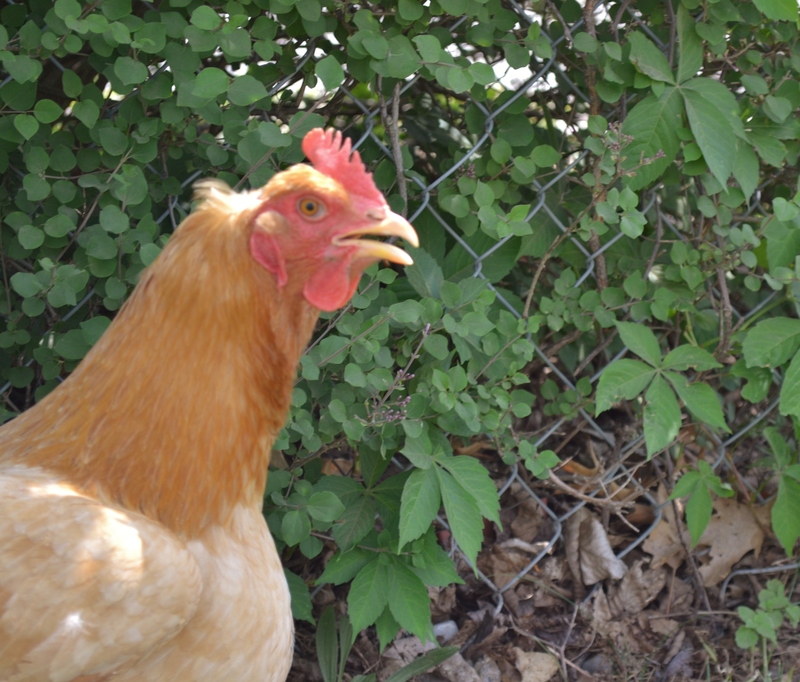 We named the hens Lady Madonna (that’s her in the photo), Henny Penny, Lucy, and Ethyl. Henny Penny took a fancy to Chris right away and breaks out into a run toward him whenever she sees him. It could have something to do with the fact that he is the one who feeds them, but it’s fun to watch at any rate. We got the chickens because we wanted the advantage of fresh eggs with higher nutrient content as well as to simply enjoy raising chickens. We had space in the otherwise unused barn and a large fenced in area and Chris enjoys raising animals, so it seemed a natural step. I started checking for eggs from the first day. A couple of times a day, I took a tour around the coop, checking the nesting boxes, the floor, and all the ledges. Then I walked all over the yard, looking for eggs. Nothing. Our hens are a breed usually raised for broiling rather than laying eggs (Freedom Rangers). They are usually not as prolific with egg-laying as other breeds. While we plan to add more traditionally egg-laying pullets (no roosters!) over the next couple of months, we got these mostly because Chris had finished our coop and the opportunity presented itself to get these four hens. We waited almost two weeks. Every day the same question: Did you find any eggs? Answer: Nope. Repeat daily, sometimes several times a day. Nope. Nope. Nope. Nothing. We started getting a little nervous. Would they lay eggs at all? I was already attached to our “girls”, and loved watching their antics, even though I still felt cautious around them. We decided we were keeping them regardless. Then it happened. 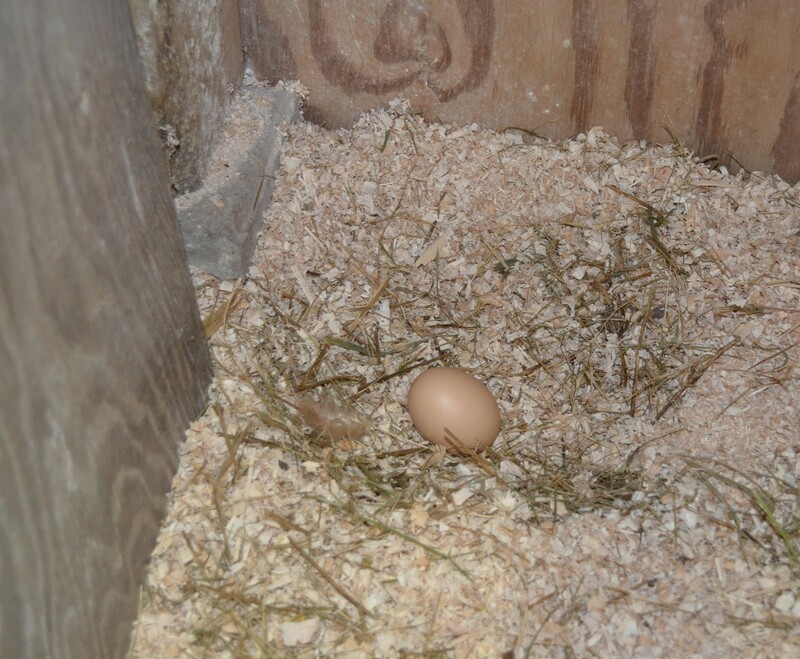 Chris went out to clean the coop and check on the “girls.” There, in the coop (not in the nesting box, but that’s another story of chicken-egg-laying lessons learned) was a beautiful, perfectly formed brown egg. You would think we’d never seen an egg before. It was simply lovely. The egg was surprisingly clean, smooth, and I’d swear it had a bit of a glow about it. We had a mini-celebration in the chicken yard. I suspect this type of reaction on our part will wear off eventually as the hens start laying regularly. Who laid the egg? Not one of the hens behaved in the least bit differently. We don’t know, but I think it was Lady Madonna. Myself, I’ll never look at an egg quite the same way. I understand now why a microbiologist would be fascinated with them. They are an oval-shaped miracle. Have you had any experience raising chickens? By Patti in Home and Family,Kitchen and Cooking,Nature .::. I wonder how much of our own needs and desires we deny? How much do we tolerate on a daily basis? Further, how many of us have been doing this for so long that we don’t even realize that we are living an auto-pilot life? Or worse, living a life based on fear and defensiveness. We run the risk of losing essential parts of our selves and blindly living a whitewashed life when we ignore our own vibrant characteristics. What would we do or ask for if a magical fairy godmother appeared and said she would grant us a dozen small wishes that would allow us to be more authentic and to do the things that would allow us to ‘make satisfying contact with others in the world’? Have we worn our masks and locked away our core talents for so long that we would not even know what to ask for? Have we become so accustomed to “making do and making a living” that we don’t even know anymore which simple pleasures of our world would wake up our inner joy? What talent, quirk, trait, activity, or expression are you denying or that you have neglected so long that you forgot you even enjoyed it? And do we hide these out of duty or out of fear that someone might criticize it? Or did we just get in a rut that obscured our connection? How do you begin healing your life, and finding authentic joy and meaning in each day? I’m still thinking about this one and I think I’ll start a list of my own rusty-dusty aspects that are locked away, longing for expression. May this help you to awaken those beautiful, sleeping parts that are surely inside you. Namaste. By Patti in Meditation,Self-Growth .::. The snow storm that I was experiencing in the last post is just a memory now. The storm came, brought brief blinding white-out moments, bitter wind, and drifts of snow just large enough to make us spend a good part of our morning clearing it away so we could get the vehicles out of the garage and eventually out of the driveway. The storm passed, though, and the snow melted away. Today, the world outside my window stretches in browns and dull greens across the fields and meets a horizon of grey-blue clouds. Today, I feel a promise of spring. I thought about this last snow storm. I don’t know why I’ve singled this one, because here in northern Indiana we get blizzard-like storms at least once a year. Maybe it was just the right time for the Universe to give me some insight. I saw this storm as part of nature’s rhythm or pattern. Patterns and rhythms that are transient and predictable from a large perspective. We, as humans, are part of nature, part of a bigger system that has yet to be fully explained. We can observe the patterns in nature on a larger scale and then see how these patterns run parallel or reflect in the smaller rhythms that comprise our lives. Don’t we have times of unexpected change so intense that we have moments of frozen blindness? Winds of change that come with bitter, stinging thoughts, actions and words that push fiercely against and around us? Times when we can only seek shelter, stay aware, and let it all play out? And eventually it does end and we slowly collect our thoughts and our strength and begin to take the steps to clear ourselves out of the storm and the debris or damage that the storm has left. It brings to mind the proverb: And this, too, shall pass away. It’s something to keep in focus when life brings a storm. When things seem out of control, and you are experiencing a life storm or even a series of life storms, it is ok to spend some time observing, focusing, and to recognize that sometimes things do happen that are on a scale that is larger than the rhythms of our simple lives. We accept, allow, seek shelter, defend, wait, and eventually plan and initiate our recovery. Most important, we don’t lose focus on the realization that this is just a storm. It will pass. And when it is done, you will look around, pick up the pieces and begin to do what you know you must do. And you will know what to do once you’ve observed, considered, perhaps asked for help, and then started taking those first “after the storm” steps. So that is what I was thinking about on this Sunday morning while I’m taking a break from my own storm … tax season. May you face all of your storms with grace, strength, and the power of love. By Patti in Beauty,Meditation,Nature,Self-Growth .::. There is a snow storm raging outside as I post this. The storm probably sounds worse than it actually is. The wind is roaring and occasionally rattling the windows, but most of all, it is blowing the snow into smooth curved drifts around the yard. I’ll enjoy listening to the wind just before I fall asleep. A warm blanket and a soft pillow just enhances the effect. Things are still out of sync at the house, with tax season in full gear and the kitchen remodel experiencing mishap after mishap. We’re six weeks into the project and no finished kitchen in sight. It will probably be another month! (Did I mention that this was supposed to be a three week project?) The contractors have hooked up a temporary kitchen sink and I never thought I’d feel so blessed just to have a sink and running water. Washing dishes in a little oval of a sink in the bathroom will do that to you. Enough of the grumbling. 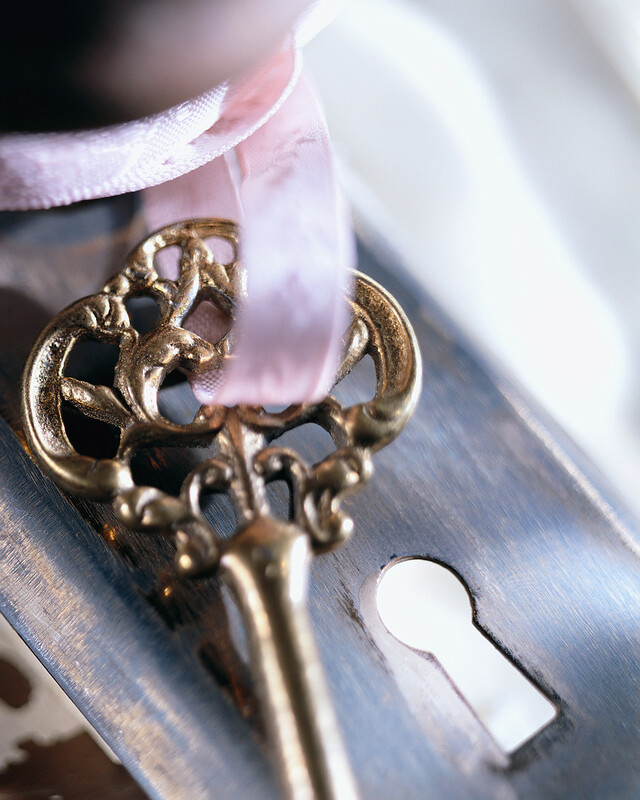 Today I’m going to share a great article … 10 Steps to Simplify Your Life . 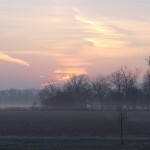 I’ve just posted this article to the Simple Life site. Take a look and try at least one of the steps today. Now I’m going to listen to the snow storm. I’d watch it out the window, but it’s too dark. I’ll just have to wait until morning to see how much snow the wind bought in. It’s a little exciting. I hope that you are safe from any storms. By Patti in Home and Family,Nature .::. Things are still hectic at the house – the kitchen and dining room remodel is in full dust-wood-studs-and-mess mode, and since it’s tax season, the office is in turbo charge. I’ll post more about the remodeling soon, because it is providing a long list of life lessons, many of them a little painful. Some are to be expected when remodeling a 100+ year old house. Others could have been avoided. 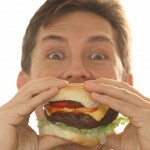 Right now I wanted to share with you a blog post from Rodale.com – 14 Foods You Should Never Eat. This is a list of the foods the experts avoid. A couple of the foods on the list are a little extreme (avoid all bread, for instance), but several of them have solid, surprising reasons for being on the list. Here at Simple Life, we believe that the foods you eat can have a profound affect on your health and emotions. One of the fundamental parts of simplifying your life is learning to nurture your body and mind. Here is the brief list … visit the link at the bottom for the full article. It’s worth the read, especially if you have children. There you have it. Some of the foods really should be avoided altogether. Others should be kept in mind and consumption reduced. A couple seem a bit extreme – avoid ALL bread, ALL white chocolate? Hmmm. A few of the things on the list I hardly ever eat anyway, such as restaurant Ice Cream Sundaes, so I’ll keep it in mind but I doubt that eating one every few years will have much effect on my health! By Patti in Home and Family,Kitchen and Cooking .::. The flu is making it’s miserable rounds again. Symptoms of this year’s flu are coughing, sneezing, fever, nasal congestion, overall weakness. There are two really powerful things you can do to either avoid getting the flu this year (and any other year, actually) or to reduce the intensity of the flu if you do get it. 1. Wash your hands. The flu virus can live for many hours on surfaces like doorknobs, desktops, bathroom floors and counters, pencils, cell phones … etc etc. If you touch something in public, wash your hands. It’s that simple, really. Lots of soap. Lots of water. Wash those little buggers right down the drain. 2. Don’t touch your mouth, nose, or ears. At all. The main way you will infect yourself is by touching a contaminated surface and then introducing the virus to your mouth, nose, or eyes. Don’t touch your face at all unless you’ve just washed your hands. By Patti in Home and Family .::. The last three weeks have been a blur of activity -Christmas, New Year’s Eve and Day, my son finding and moving to his perfect place to live, the contractor finalizing the plans and setting the date for our new kitchen remodeling job, tax season beginning, …. I’m sure there’s more but I think I may have missed it as it whizzed by. One thing I didn’t miss was the New Year and taking the time to review my goals from last year and to begin writing my goals for 2013. Each year, I take my time with the goals and give myself a week or so to think them through and write them out. Sometimes my goal list is a little more like a journal or a letter to myself than the more typical list of New Years resolutions. Once I’m all done, though, I’ll go back and pick the most important goals to concentrate on and I’ll write them in a few powerful words so that they will be easy to remember and review. How about you? Did you make any New Year’s resolutions? I hope that you had a very Happy New Year! By Patti in Prosperity,Self-Growth .::. 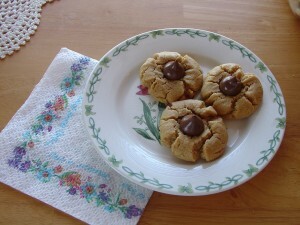 This recipe for Peanut Butter Kiss Cookies has been popular on the Simple Life Corp site. They are deceptively simple – just five ingredients (including the Hershey kiss) – and require no flour. If you are looking for a quick cookie to make for a gift basket or for a last minute party, this is an excellent choice. The ingredients are: peanut butter, sugar, baking soda, egg, and Hershey Kisses. When you taste them, you’d swear they are made with flour and butter and all the standard cookie ingredients. No one has to know it took you ten minutes to stir them up and put them in the oven. I hope that you found this helpful! Are you looking for ideas for low cost gifts? You’d like the gift to have some meaning, yet avoid the extravagances? On our sister site, The Fat Dollar, I’ve posted a long list of gift ideas that will be special, yet still within budget. Click here to visit the article More Inexpensive Gift Ideas – $10 or Less. A gift is an expression. 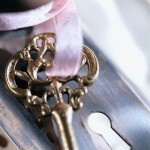 It can be an expression of love, of gratitude, an acknowledgement, an expression of friendship, or just a fun exchange. 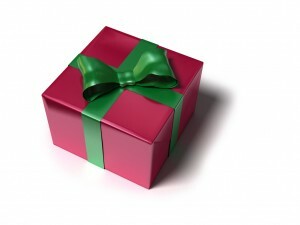 What makes a gift special is not the cost, but the ability of the gift to convey to the recipient that they are special in some way and that the giver of the gift has made an effort to truly connect with them and has paid attention to their interests, needs, and unique qualities. This is why a silk tie with an unusual design would be a puzzling, even disappointing present for most men, yet would be absolutely cherished by a man who makes a hobby of collecting and wearing odd ties. Along the same line a Mickey-Mouse-driving-a-race-car tie might be a delight for Dad when his four-year-old proudly and excitedly announces that he specially picked that tie himself because Dad had taken him to Disney World last summer. Of course that still doesn’t mean that Dad will actually wear the tie. An Adoration or Admiration box – decorate a box and fill it with slips of paper where each slip has one statement about something that the giver loves, admires, or appreciates about the recipient. Several book ideas for men, kids, and cat lovers. Just a bit over two weeks left until Christmas. How about you? What ideas do you have for gifts where the expression is bigger than the price tag? By Patti in Frugality,Home and Family .::. 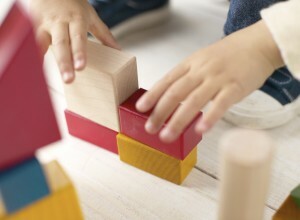 When something is out of balance in our lives, it can cause other areas of our lives to tilt into what feels like chaos. As an accountant, balance is a nearly obsessive trait of my profession, especially in the area of bookkeeping. Ok, ok, maybe balance is more than nearly an obsession. While that is often confining, like many extremes that we experience, it has taught me some lessons in dealing with life. No, no. I’m not going to insist that each and every part of your life must be in perfect balance in order for you to be happy. (You’d expect that advice from an accountant, wouldn’t you?) Maybe 10 years ago I would have offered that, but I’ve stumbled my way through to realizing just how stifling it is to expect perfection with everything, even in the field of accounting. What I am going to suggest as something that you may want to try is a method that I frequently use in my CPA practice when working with client projects. When a bookkeeping error emerges and the accounts won’t balance, it can often seem like all the numbers are wrong and the books are just hopelessly out of balance. When that happens, or preferably before we reach that point of frustration, we have two methods that help us to quickly hone in on the problem. First, we calculate the amount that we are off. For example, if a checkbook register won’t balance to the bank statement, we subtract the bank balance figure from the adjusted check register figure to determine the dollar amount of the imbalance. Sometimes this is all that is necessary … we may calculate that we are $23.92 off and glance at the register or the bank statement and see a check or a debit for that amount and zoom right in on the area of the problem. Second, if we have not already quickly found the issue, we will start matching and eliminating the areas that do balance. In our same example, we may be able to add up the deposits on the register and determine that the total balances with the amount showing for total deposits on the bank statement. We continue on with different totals and sections of the check register/bank statement to find out what does balance and to hone in on the section that does not balance. This eliminates the need to go over the register or bank statement line by line to find the problem. Usually, when we combine these two methods, we very quickly find the pesky imbalance. Pesky is a mild word sometimes, but we won’t go there right now. Once we correct the number, it seems almost miraculous to find that all the numbers depending on that one calculation now snap back into place and the books are now in balance. So how could this possibly relate to the real world? Or more specifically, to your beautiful life? Let’s start with the larger picture: When your life feels chaotic, or totally out of balance, it feels like everything is tilted. Nothing makes sense, everything seems out of your control, you are exhausted, confused, and demoralized. In the project of life, flipping the sequence of the above steps may be the answer for helping you get your life back in balance. First, start backwards. What is working? Maybe you’ve still managed to eat healthy meals, however hurried. Maybe you are getting to work on time everyday, even though your mind is racing during the whole commute. Maybe your mom or spouse is being extra supportive, even though there is not much they can really do. Maybe you have a lovely home that you’ve managed to keep more or less clean. Maybe the kids are happy with their school and friends. Once you start setting aside the areas that are fundamentally working, even though your mind has been too frazzled to allow you to appreciate them, then you can begin honing in on the area or areas that really are out of balance. For example, once you’ve recognized that things are basically fine with your home, your spouse, your kids, and even your mom, then you may realize that it is your job that is out of balance and that imbalance is spilling out and affecting the rest of your life. So now you can further examine the job. Do the same exercise: determine what is fundamentally fine with your work and then begin your close examination of the areas that are creating the disruption. You may determine that you have acceptably good co-workers, a great boss, an easy commute, and good pay. Yet you dislike the type of work or maybe the workload is overwhelming. Once you’ve defined the offending areas, now go back to our step one: figure out, as best you can, just how much it is out of balance. You may decide that the workload will be crushing for just for the next two weeks, or you may decide that you don’t want to deal directly with customers anymore, or perhaps you really can’t stand accounting (gasp!) and you want a line of work that is less rigid. Now that you know the area that is causing all the unrest and you have calculated a measure of the problem, you can more easily begin to work on solutions. Maybe you will just endure the next two weeks by meditating or temporarily relaxing your other responsibilities, or maybe you will ask for a shift in your duties, or maybe you will decide to go back to school to train for a different career. It’s easier to work on the one identified area than it is to have the feeling that you are helpless because you think your whole life is hopelessly tangled. Now, realistically it may not always be this simple. Sometimes more than one thing has become problematic. Maybe your toddler (or teenager) is acting out, you just got transferred into a department with the boss from h*ll, and at the same time the mortgage company just sent you a lovely notice that your monthly payment is going to increase by $203.00 a month. You can still use the same process when multiple parts of your life seem upsetting . Acknowledge the areas that are really fine, even though you’ve been too harried to acknowledge them. Then begin to examine the areas that do need your attention. Ask your self what might bring your life back in balance. Start with one of the ideas and figure out the steps you need to take to fix it You will often be surprised to find that when one area comes back into balance, that other areas settle back into balance, too. For example, you may find that once your are at ease because you have determined how you will pay the extra $203.00 monthly mortgage payment, your toddler (or teenager) may pick up on your cues and relax a little, too. There is another part of balancing accounting records that you should know: when searching for solutions, sometimes you need to guess. Sometimes, we will pencil in the correction that we think will work, and we run the numbers to see if it works. Hurray if it does, back to the drawing board if it does not. You will find that sometimes, even though you know the area of imbalance, you will need to take your best guess about what will solve the problem, and then take a step or two to see if it really is the solution. If you think you need a new career, you may sign up for a class in the new field, or you may spend a day researching to determine which career you may prefer. From there, you can decide to either continue on, or you can start again with a new set of steps in another direction. And in life, not only is everything not always in balance, but it’s often perfectly ok for a few things to be out of balance or imperfect. The secret is in getting things enough in balance that you are able to easily flow with the changes and challenges as they appear. Now, about your check register…. By Patti in Home and Family,Self-Growth . ::.